ECYH Trust is a housing charity that helps young people aged 16-25 years old, by providing high quality, supported, affordable housing and work experience in building skills. East Cleveland Youth Housing Trust formed in 2000, following a study into young people’s housing and training needs by Tees Valley Rural Community Council (TVRCC) and Community Campus 87. It revealed that young people generally wanted to live and work near their homes, but in some cases were unable to do so. We acquired our first property in 2000. The owner of the property could not afford to renovate it and the Trust had no money, so we reached an agreement with the proprietor to lease the property for a peppercorn rent of £200per annum for 6 years; in return for this we would renovate the property and let it to young people at an affordable rate. With continued support from Community Campus 87 and TVRCC, and with financial help from charitable trusts, Single Regeneration Budget (SRB), Redcar & Cleveland Council and the Neighbourhood Renewal Fund, the Trust has grown and, thanks to the low property prices in East Cleveland, has been able to purchase its own properties We have now acquired 14 properties in the East Cleveland area. We received £119k from the DCLG’s Empty Homes Community Grants Programme and were able to acquire three properties. The Programme has now come to an end, but we’re still able to acquire and renovate properties Our purchase and renovations are funded through a number of charitable trusts such as; The Ballinger Trust, Henry Smith and Help the Homeless to name a few. We spend on average £10.000 – £15.000 on renovations. We work to help young people take a first independent step towards training and employment, by providing an opportunity for them to grow in a real work environment that can help to bring out their potential. Our building team do most of the renovation works, although occasionally have to get skilled contractors in to do specialist work. Whilst with us apprentices and volunteers gain on site training, work towards their NVQ’s, CSCS Card, Health & Safety in the work place, Manual Handling, Fire Awareness, First Aid and Customer Care. And of course all aspects of renovation, plumbing, plastering, rendering, etc. We also provide team building activities such as; outward bound weekends. Quad biking, clay pigeon shooting & BBQ’s. Once renovated our properties provide well designed, good quality accommodation for young people in housing need, helping them move towards independence and greater responsibility. We have a part time Tenancy Support Worker who offers support with budgeting, improving confidence, developing networks, reducing isolation, improving well-being and health and enabling them to succeed in their tenancy. Last year we housed 19 young people and we currently have 14 tenants in our properties. However, the number increases year after year and we hope it will continue to grow. Another aspect of the trust is the social enterprise working with a variety of community groups, such as village halls, churches & Youth Centres to provide high quality building services. This work gives young people the opportunity to counter negative stereotypes, demonstrate their abilities and make a positive contribution to their communities. 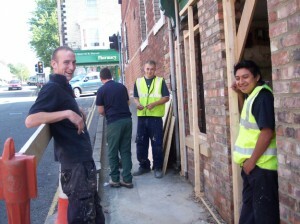 Our work includes adaptation for disabilities, painting & decorating, installing kitchens, gardening & landscaping. We currently work with over 50 community & voluntary sector groups and our customer base continues to increase year upon year. Crown Heights former pub will be transformed into 4 x two bedroom flats. 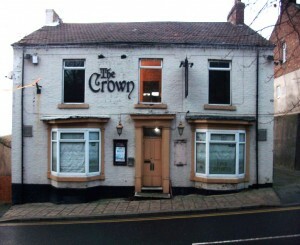 We have recently purchased an old high street public house with funding carried over from the Northern Rock Foundation. The property had sat empty for 18 months and we are currently transforming it into 4 two bedroom flats. The renovation will provide 12 months of employment and training for 35+ 16-25 year old’s and 180 days of work experience for volunteers. So far the project has helped us employ 2 new apprentices and has secured an additional year of training for our previous apprentices. We also have planning permission to build on the car park at the rear and this could provide further accommodation. Increase ECYHT’s prospect to work without undue reliance on funders, and move closer to becoming a self-sustaining social business.